It’s been a long time since I’ve made a non-alcoholic drink. 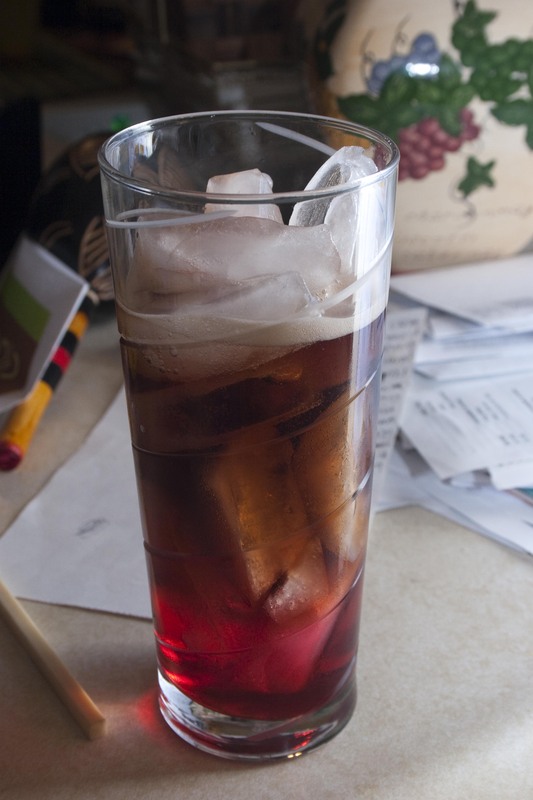 When I started this blog, I wanted to make sure I got my fair share of “mocktails” made up. After all, just because you’re underage, you’re the designated driver, or you’re a teetotaler doesn’t mean you can’t take part in some awesomely made and fancily dressed up drinks. To top it off, it’s my stepson’s 12th birthday today. Which makes me feel ridiciously old. But, it also means that in his honor I’m going to make a non-alcoholic drink that he’ll be able to toast his last year as a tween! No, not that! That's the Hungarian Horntail and... And god, I'm a geek. I altered this recipe for my own personal taste (and knowing what my stepson likes). Pour the grenadine and cordial into a highball glass filled with ice. Top with cola, add a chopstick and present to your dinker BEFORE stirring it. You get a very cool separation of colors. Mix, then sip. This is very VERY good. It’s like a modified Roy Rogers, actually. The sweetness of the grenadine goes with the cola (of course), but that lime cordial adds an interesting little bite on the end. Definitely a great change up from the standards we’ve grown tired of making! I really liked it, Jenn wasn’t much of a fan. But, what did the birthday boy think? I think you need to have a week long series of drinks that are named after Harry Potter references. Just saying.